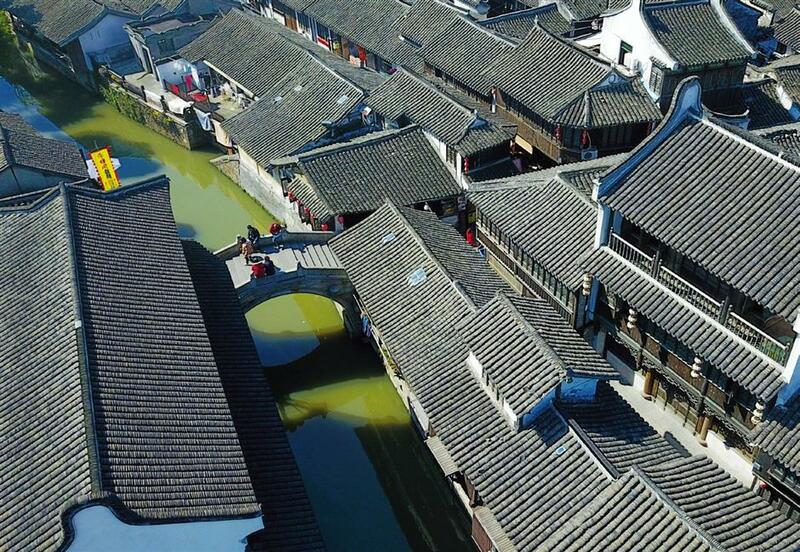 Xinchang Ancient Town features river ways and typical houses south of the Yangtze River. With the assistance of Shanghai Xinchang Culture and Creative Co, China Construction Bank introduced its inclusive financial products to small and micro businesses to fully support their development in Xinchang Town. Xinchang, a small town in Pudong’s Nanhui area, is a major planting site of peaches. The local juicy peaches were recognized as one of China’s distinctive agricultural products. Apart from its ideal natural conditions the development of growing peaches can’t get away from the efforts of Xinchang’s agricultural cooperatives. One of the biggest cooperatives has 720 contractors, all of them locals. To build a stronger business, financing is a major factor. The Shanghai branch of CCB has linked up with the cooperative for more than a decade and provided nearly 40 million yuan (US$5.8 million) of bank loans to make it one of the best-sellers of Nanhui peaches and help local farmers to get more money from the business. Since Xinchang has focused on the key words “ancient town,” “culture and creative” and agritourism, CCB has taken action to protect the town’s development, support more cultural and creative startups and benefit local residents with inclusive finance. Xinchang was the only town in Pudong included in a characteristic towns list from around the country last August. Having convenient services is one of the major indicators to measure whether a small town can become a characteristic town and CCB’s techno finance helped Xinchang build a mobile payment system. Local retailers are using QR codes developed by CCB for in-store payments which accept Alipay, WeChat Pay and UnionPay. As early as May 2015, CCB Pudong branch agreed with Xinchang Ancient Town Co to tailor its financial service in line with the development of Xinchang. It offered the operator of the ancient town a 60-million-yuan bank loan over a three-year term and provided more than 100 retailers in Xinchang CCB payment service. Even the parking lot accepts mobile payment. Xinchang is the biggest historic area in Pudong and with the most abundant of historic resources. Hence, CCB granted 100 million yuan of bank loan in May to ensure the protection of the area’s historic buildings and the relocation after that. The CCB also financially supports local artists to upgrade their equipment or renew workshops to cluster talented entrepreneurs and creative businesses. With the help of CCB, the 311 workshop has grown into a hub of printing business and print artists. At the same time, a cultural space nearby is now a mix of cafés, DIY kitchens and shared bookstores. Having good views is a must for a characteristic town of China and CCB helped develop the local countryside park and a riverfront promenade. All 13 villages in Xinchang were gifted mobile devices as CCB’s “last mile” service. Villagers pay their bills, transfer from their bank accounts, make deposits or withdrawals, or inquire through the devices for their personal accounts of housing provident fund.